Money Replaces Willpower In Programs Promoting Weight Loss : Shots - Health News A group of nurses is competing for $10,000 in a weight-loss contest. A New York man motivated himself by pledging to donate to a cause he hated. Both approaches use money to reach a target weight. But which is better — the carrot or the stick? Peggy Renzi (middle) talks with her teammates Erika Hersey (left) and Erica Webster. The three are part of a team of nurses in the Bowie Health Center emergency room in Bowie, Md., who are working together to lose weight. Teammates (from left) Erica Webster, Peggy Renzi, Erika Hersey, Quan Harper and Nyuma Harrison entered a national weight loss contest in hopes of winning $10,000. Nyuma Harrison uses her phone and social networking websites to track progress and motivate the team. 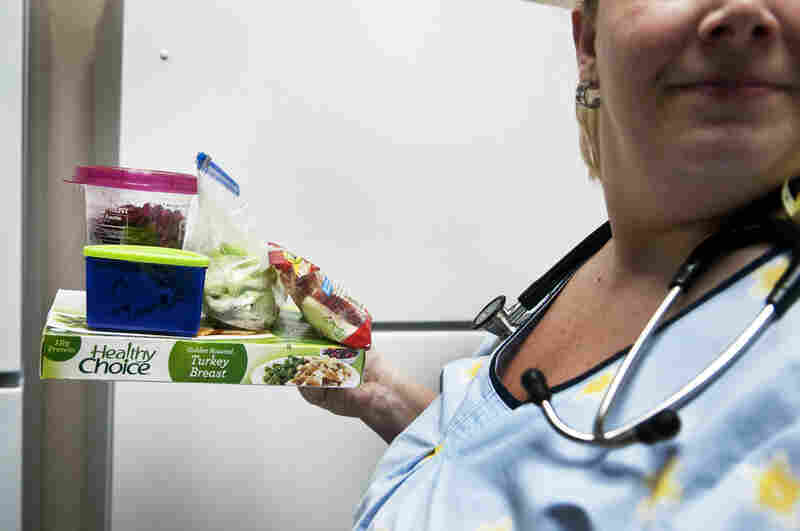 Nurse Peggy Renzi makes the effort to bring a healthy lunch to work every day instead of buying snacks from the vending machines or grabbing fast food. Erika Hersey is more careful now about the types of groceries she buys, opting for healthier selections. 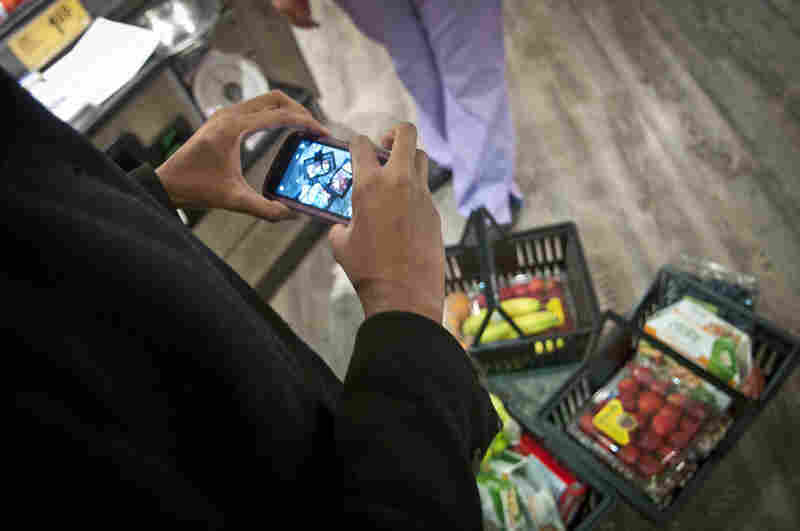 Nyuma Harrison photographs the groceries she purchased. She will share the images with her teammates. 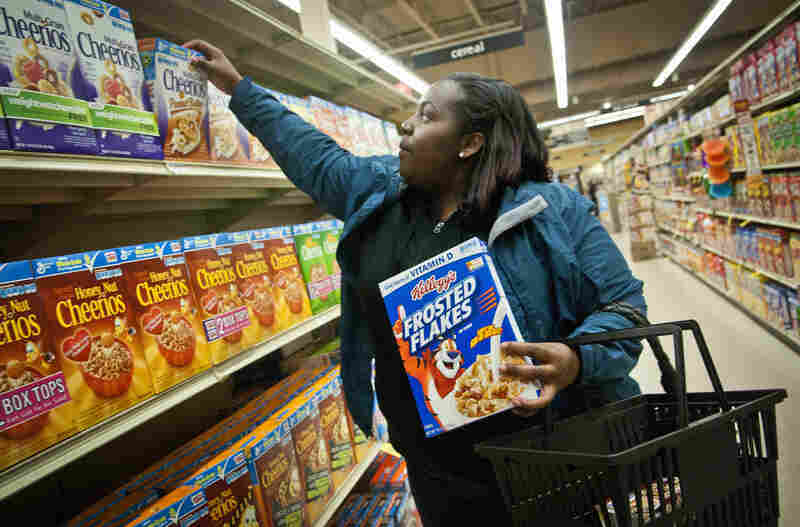 Sticking to a diet is a challenge for many people, but starting next year, Americans may have an even bigger, financial incentive to keep their weight in check. The new health care law includes a provision that would allow employers with more than 50 employees to require overweight workers who do not exercise to pay more to cover their insurance costs. 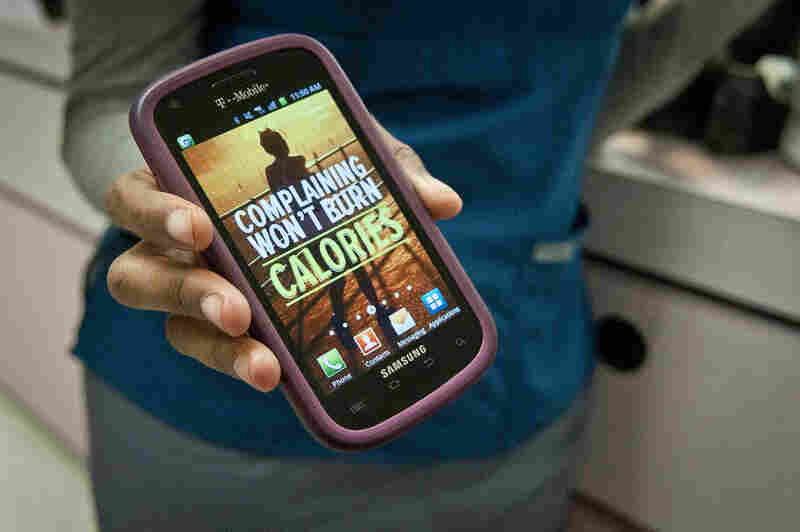 Some employers, inspired in part by the success of shows like The Biggest Loser, are already designing weight-loss programs that use money to succeed where willpower has failed. For Peggy Renzi and her colleagues at Bowie Health Center in Bowie, Md., the war against weight is waged in the emergency room where they work. The nurses say most of their patients are either overweight or obese. They sometimes require extra-large stretchers or ambulances, as well as extra nurses to haul all that extra girth, Renzi says. And this is not just an issue for patients. The nurses grapple with their own weight and say they face their own temptations. Nyuma Harrison points to a long countertop. "Sometimes on a shift, this whole table is cake and cookies and chips. And when there's nothing on it, we kind of feel like there's something missing in the world. ... It's nice, it's sociable, but the long-term effects are not that great," the nurse says. So last month, Renzi, Harrison and three other co-workers entered a national weight-loss contest sponsored by HealthyWage. The company sponsors its own contests and also works with employers to set up similar challenges for their workers. 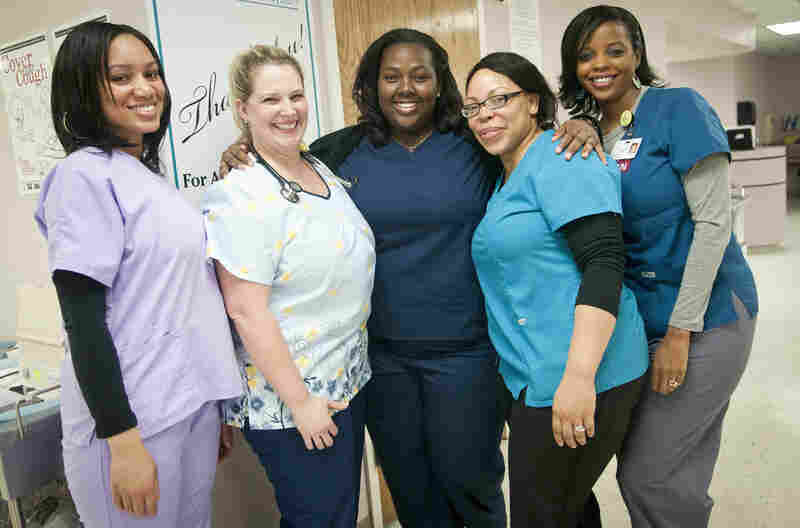 Over three months, the nurses hope to shed at least 10 percent of their weight and win $10,000. After two weeks, "the Divas" — that's their team moniker — had lost 26 pounds. The team relies heavily on their mobile phones and social networking sites to track progress and keep tabs on each other. Harrison urges the Divas to call for help when facing temptation. She calls these "man down" calls. "It's like a 911 call. It doesn't matter where we are — in the bed, asleep, at work — all of a sudden the phones are going off. Everyone's like, 'drink some water, have some lemon, take the bottle away from her,' " she says. Their path isn't an easy one. The vast majority of weight loss attempts fail. Studies show monetary rewards are effective in helping people who want to quit smoking or taking illegal drugs, says economist John Cawley of Cornell University. But food is different. People need to eat, and going back to old eating habits is a lifelong challenge. Cawley's research shows three-quarters of people give up on diets, even if they stand to gain a lot of money. Employers and health insurance companies are experimenting with ways to structure financial incentives — as well as disincentives — to encourage weight loss. King County in Washington state, for example, says it saved $6 million between 2007 and 2011, in part by offering incentives to some 2,000 county employees to lose at least 5 percent of their body weight. Cawley says the overall objective of pushing employees to become healthier makes a lot of financial sense. "All of us are paying the consequences of these unhealthy behaviors, so it actually does make sense to set up incentive programs to force people making these choices to take into account the costs that they're imposing on society," he says. But the structure of the incentive matters, he says. Cawley worries that some programs may create perverse incentives to lose weight quickly but not sustainably. And giving money away may not be the best answer: Cawley's work shows that people fight harder to shed weight if they stand to lose money. Take Chester Demel. Peer pressure and encouragement didn't help him stick to diets. But hate? Hate motivates. Last year, Demel pledged on a website called StickK to shed a pound every week. And if he failed, he agreed to fork over $5 to a cause he dislikes. The selection of "anti-charities" spans the political spectrum; Demel chose the National Rifle Association. When he thinks about them, "my blood boils. I get really angry," he says. Instead of thinking of doughnuts, Demel started hearing the theme from Rocky. Fancying himself a lean and hungry Rocky Balboa, he would scramble up five floors to his New York City apartment. He shed 45 pounds in a year. "The punitive thing works for me," Demel says. Harrison, the nurse, says neither money nor punishment alone would work for her or her teammates. "I think the money is a bonus, but we're really not worried about the money," she says, "not because we have a lot of money, but because if we don't win the challenge, we'll still really be in a good place. So there really is nothing to lose — except some pounds." And anyway, there are other financial incentives that have nothing to do with prizes. "I do notice that I spend more in the grocery store," she says, "but I always tell myself, it's a lot cheaper than dialysis."